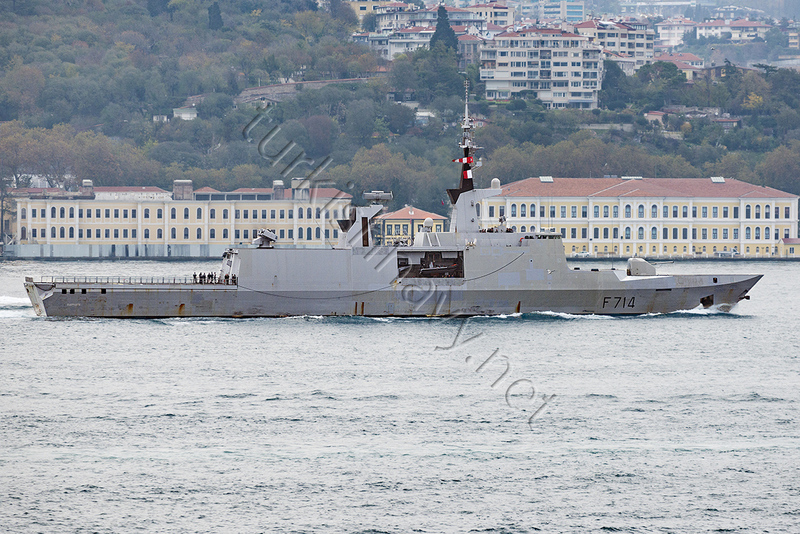 French La Fayette class frigate F-714 FS Guépratte transiting toward the Black Sea. According to Georgian website agenda.ge, French frigate FS Guépratte will make a port visit in Batumi Georgia between 22nd and 25th November. The ship was met with a welcoming ceremony at the Batumi port. Following the ceremony, French Ambassador to Georgia Pascal Meunier and Commander Jacques Mallard have met local authorities and officials of the Georgian coastguard department. During the visit of the frigate French and Georgian sailors will conduct joint diving, search and rescue, firefighting exercises on 23rd and 24th November. 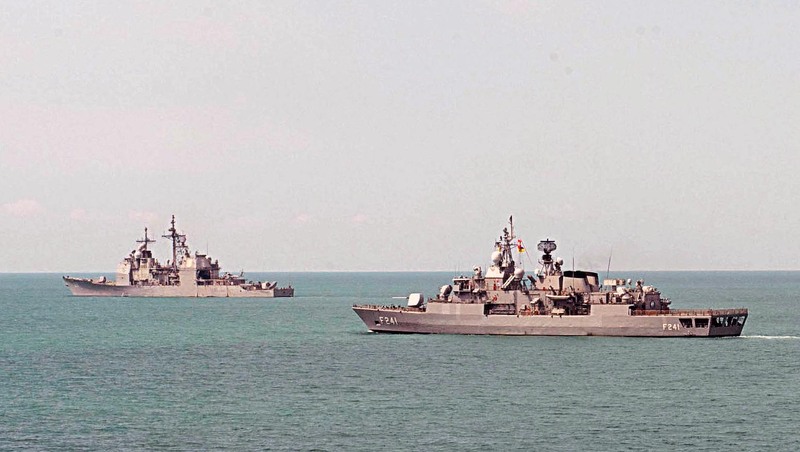 The French frigate will leave Batumi on November 25. A Mk-24 Mod. 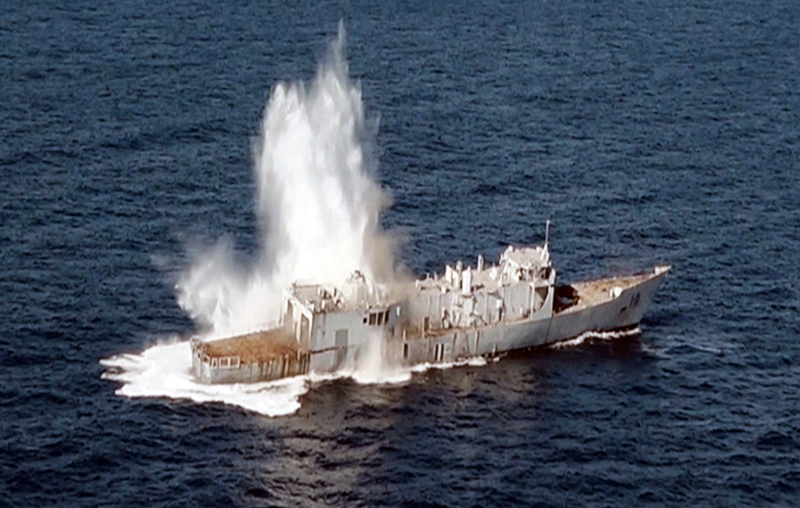 2 Tigerfish hits ex-USS Duncan. 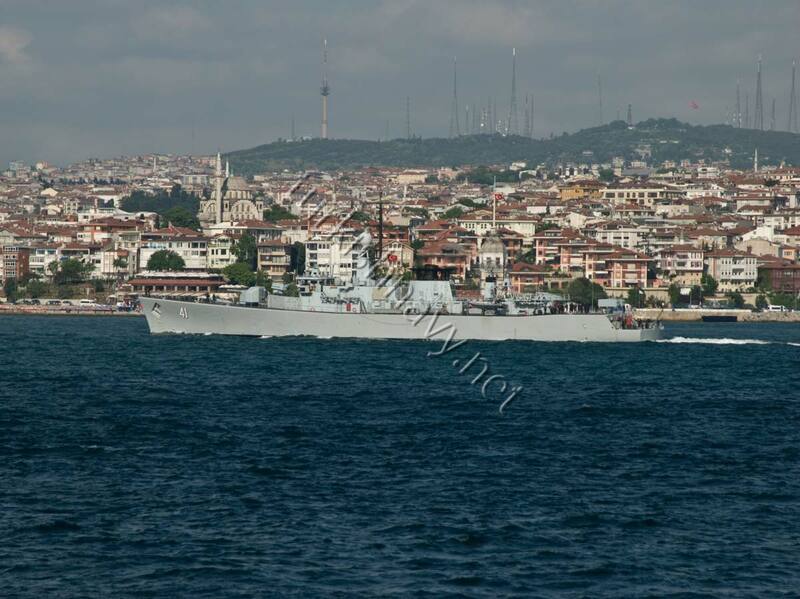 Photo: Turkish Naval Forces. Ex-US Navy frigate Duncan has found her watery grave after all. She was bought from US Navy as a spare part source for the 8 existing Gabya class frigates in service, a procedure also known as cannibalization. The hull of Duncan was observed being towed through Istanbul towards the Black Sea on 22nd March 2017. At that time, it was speculated that she would be sunk as a target during the coming naval exercise Deniz Yıldızı as the markings on the hull left nothing to the imagination. She somehow survived the exercise that was held between 29th March and 9th April. According to Turkish Navy, ex-USS Duncan was sunk in the Black Sea on 4th October 2017, by a Mk-24 Mod. 2 Tigerfish torpedo, fired from TCG Sakarya, a Preveze class submarine. F-41 BS Drazki during her northbound transit in Bosphorus, on 3 June 2011. On 9. June 2017, a Panther helicopter of Bulgarian Navy collided with the frigate Drazki and crashed into the sea. The two of the 3 strong crew were rescued. The pilot unfortunately lost his life. Bulgarian Navy purchased 3 AS 565MB Panther helicopters from Airbus in 2011. The Panther has replaced older Soviet era helicopters for naval operations. Since none of the Bulgarian warships have landing platforms or hangars, all the helicopters are land based. 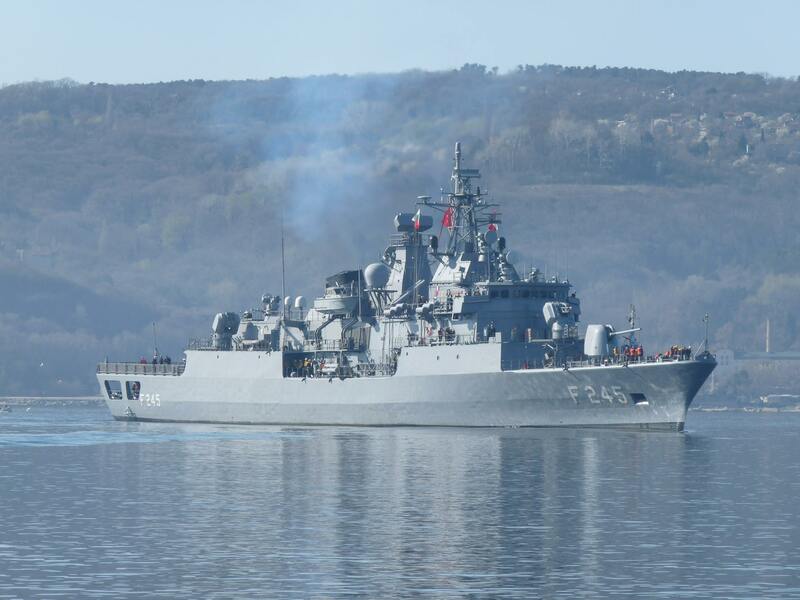 On 9 June the helicopter was conducting a naval training with the frigate Drazki and other warships when the helicopter collided with the mast of the frigate and crashed. The pilot Captain Georgi Atanasov died while the Captain Pavel Simeonov and captain Anatoly Apostolovwere rescued by the sailors from the ship. The survivors are in stable condition. With this accident Bulgarian Navy lost %30 percent of her aviation assets. The stricken Liman look very much just like this ship, her sister Kildin. Here Kildin moving northbound in November 2016. On 27th April 2017 the Russian intelligence gathering ship Liman sunk off the coast of Istanbul. The Project 861 / Moma class ship of Russian Black Sea Fleet was approximately 17 nautical miles northwest of the northern entrance of Istanbul Strait when Togo flagged livestock carrier Youzarsif H hit Liman. The accident happened at 08.41 UTC (11:41 local time). There was fog and the visibility was limited. This part of the Black Sea is usually used as a staging area for the ships as the wait for their turn to sail the Bosphorus. Thus there are usually many ships either adrift or sailing with very slow speed. It was apparently Youzarsif H that hit Liman since Russian ships hull was breached below the waterline. Both ship are similar in displacement around 1.500 tons and size. The damage to the Russian ship has overwhelmed the damage control party and the ship sunk at 11:48 UTC (14:48 local time). The proximate location of the incident. Turkish Directorate General of Coastal Safety dispatched life boats Kıyı Emniyeti 3, Kıyı Emniyeti 6, Kıyı Emniyeyi 8 and tug Kurtarma 3 to the accident site. Of the 78 sailors on board of Liman, 26 were rescued by life boat Kıyı Emniyeti 3, 37 by Kıyı Eminyeti 8 and 15 by Youzarsif H. There are no casualties. 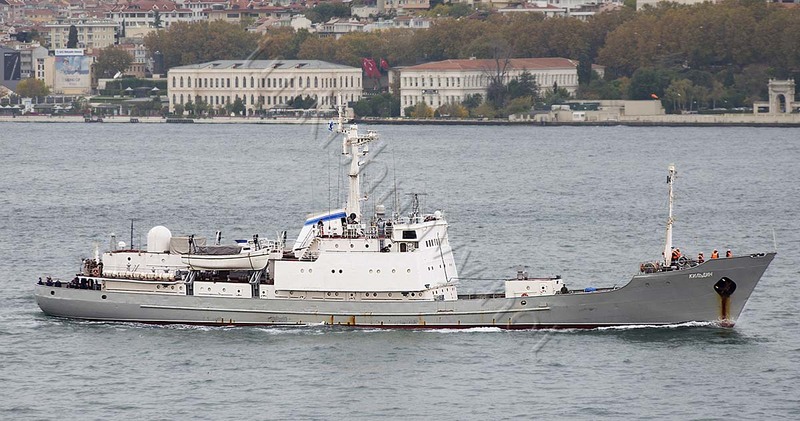 Liman was one of the 3 Project 861M / Moma class intelligence gathering ships. All are based in the Black Sea. The ship was deployed to the Mediterranean in Winter 2016 and was last seen passing northbound through Istanbul on 26 January 2017. 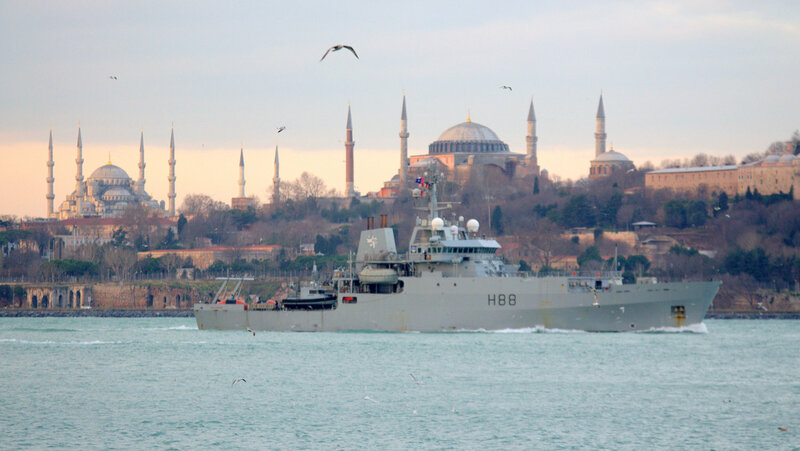 Liman was not expected to pass southbound through Istanbul Strait. 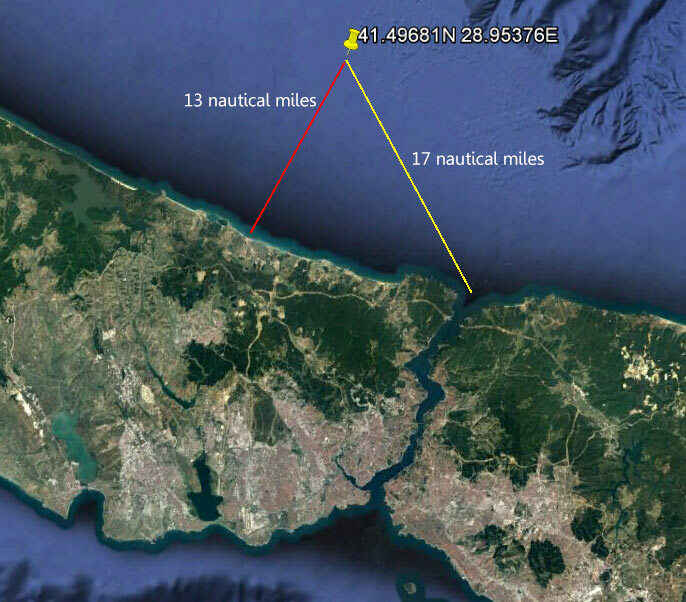 This means she was sailing just outside of the Turkish territorial waters for collecting intelligence. Intelligence gathering ships are equipped with highly sensitive sensors, special eavesdropping hardware and software to record and decipher the collected data. Some of the sailors on board must be “scientist” specialized gathering and interpreting data. A good question is whether the Russians had time to destroy the sensitive equipment before abandoning the ship. Another question is whether there will be any efforts to raise the ship or salvage any sensitive equipment that was not destroyer by the crew. Though we don’t have details, how the accident ever happened and who was right according to COLREG, it is kind a ironic, that a ship with a mission to gather all the intelligence around it, fails to see an ungainly merchant ship sailing directly on it. 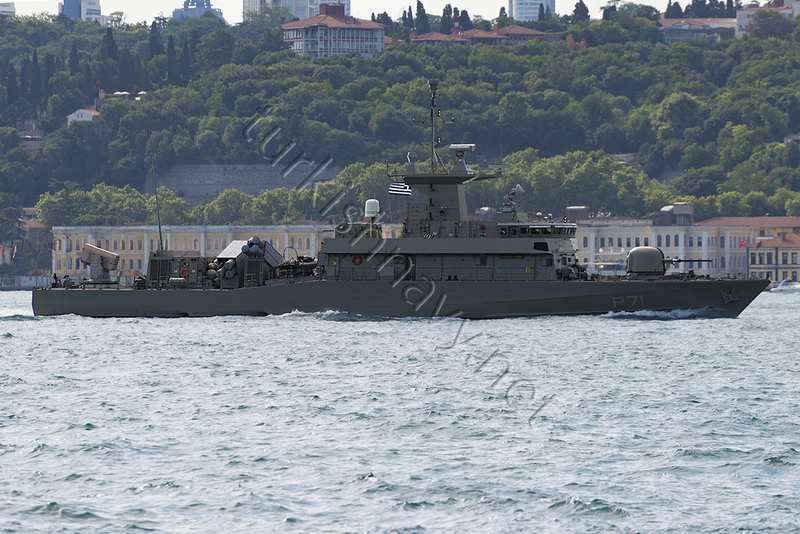 TCG Oruçreis arrives in Varna. Photo: Nikolay Zlatev. 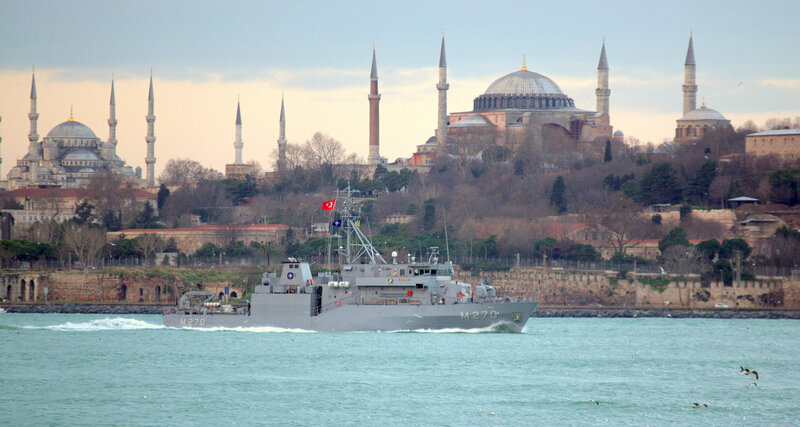 10 Turkish warships are conducting port visits in 5 different ports, in 5 different countries. The long needed rest came after the end of the first phase of naval exercise Deniz Yıldızı 2017. The exercise has started on 27 March and will end on 7 April. Of course the small size of the Black Sea helps. But Turkey is the only Black Sea nation that can perform such a diplomatic show of force. It is not a small event to do port visits in 5 different nations at the same time. This is the list of the ships doing port visits. Most of them will be open for public to visit.